Out of all of the blogs that contain cats, creepily drawn people and a real look at the world we live in, my favorite is The Oatmeal. Matthew Inman, the author and creator of The Oatmeal, shares his unique look at the world, customer service, pets (mostly cats), significant others and anything else that comes across his mind. His cartoons are usually not kid-friendly, but if you can tolerate his creative use of the English language, The Oatmeal is a great way to laugh away a few minutes or hours. Last year, Inman ran a fundraiser encouraging people to donate in support of a Nikola Tesla Museum. Sponsors who gave over $33,333 would get a blog post on The Oatmeal about their product or business. Greg and Meredith Tally, the owners of a Best Western outside of Denver, made a $35,000 donation. So Inman followed through with his promise and featured their Best Western on his blog. The Tally’s Best Western isn’t just a regular hotel. They are currently renovating it to be a dinosaur-themed hotel. How cool is that? You can swim in a Cretaceous sea pool, find dinosaurs and exhibits all around the hotel. My favorite is the hand-made ironwork that shows the history of life. Obviously, no stone has been left unturned. Even though this museum isn’t far from where I live, I want to go stay there. The renovated hotel will open in April 2013. I am hoping to visit the hotel after it reopens and report back. The hotel is located close to one of my favorite museums, the Morrison History Museum as well as Dinosaur Ridge, an area in Morrison, Colorado where you can see dinosaur tracks on the side of a mountain. 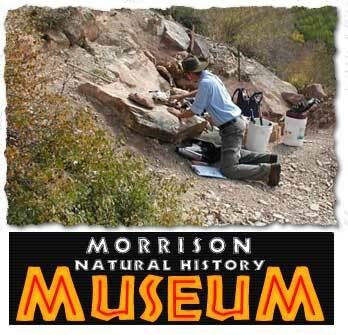 The Morrison History Museum sits in an area where many fossils have been discovered. You can stand in the museum and look out at the hill where the bones were found. My one disappointment while putting together this post? I found out I missed Inman’s visit to the hotel and Morrison History Museum. If I had only known, I would have followed him around town like a groupie, waving my Bobracha 4 Lyfe bumper sticker and How to Tell If Your Cat is Plotting to Kill You book. Follow the Best Western of Denver on Facebook for fun and entertaining posts dedicated to dinosaurs. For all of you science geeks, read The Oatmeal’s post on why Nikola Tesla was the greatest geek that ever lived. Learn all about Tesla and his inventions while also discovering if you are truly a geek. Just stumbled across this amazingly nice post about the hotel and our wild dreams. Thank you so much for sharing them! Thank you Greg. I can’t wait to come visit the hotel.